Mangos are a deliciously, sweet fruit that are quite common in the tropics. Unripe mangos have a certain exterior firmness and a fairly consistent green skin color. 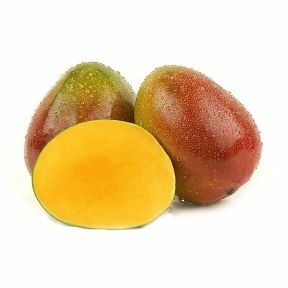 Ripe mangos are fiery and very colorful, displaying green to yellow hues with accents of red. The exterior of ripe mangos should give slightly when pressed and exude a tropical, fruity scent. Inside, mangos yield a soft, juicy pulp that is delectable and refreshing. It is a bright yellow color with orange overtones and is tightly interwoven with the pit in the middle. Source: Central & South America and the Caribbean. Handling: Fresh Fruit, ready to eat. Can be made into milkshakes, ice creams, smoothies and fruit bars.